Sitting under high chestnuts and enjoying a cool beer - as soon as the first rays of sun warm up, a visit to Germany's beer gardens is a must! Here are some traditional beer gardens that you simply have to know. With 100, Munich boasts the largest concentration of beer gardens in Germany. The largest in the Bavarian capital is Hirschgarten, which seats 8,000. Traditionally, guests bring their own food and only order beer - a practice that has been maintained over the years. But for those whose hunger is bigger than what they brought, snacks like soft pretzels and local cheese can be purchased. In 1812, Bavaria's King Maximilian I ruled that beer gardens could be set up in Munich for the first time. The garden near the Augustinerkeller, shaded by over 100 chestnut trees, is considered the oldest. Here, beer is served from wooden kegs right in front of the guests. Whenever a fresh keg is tapped, a traditional bell-ringing ritual is celebrated. One of Bavaria's most famous beer gardens has a Chinese flair. Located in the English Garden, there is room for 7,000 beer drinkers at the Chinese Tower, making it the second-largest beer garden in the city. Here, tourists and locals like raise their one-liter glasses in a multicultural atmosphere. Bavarians take their beer gardens very seriously. In 1995, residents living near the Waldwirtschaft tavern in Grosshesselohe, which has a large beer garden, demanded an earlier closing time. That upset Bavaria's then Prime Minister Edmund Stoiber so much that a law was changed. Now beer lovers can enjoy their brew under the trees until 11:00 pm. When in Munich, many tourists make a point of traveling out to Andechs Abbey to sample the famous monastic brew. Legend has it the beverage comes from the depths of the "holy mountain" on which the monastery is located. The Benedictine monks in Andechs Abbey continue to run the brewery. The order maintains another five breweries throughout Germany. A beer garden above the cellar can still be found at Weltenburg Abbey. The Weltenburger Abbey brew is pumped via a pipeline from the fermentation cellar in the cliff to the tap, where it is served in the beer garden located in the inner courtyard of the abbey complex. Beer has been brewed in this unique location on the Danube Gorge in the heart of a nature reserve since 1050. The beer garden may be a Bavarian invention, but other cities in Germany have adopted it and adapted it to their local brewing culture. In Cologne, the local brew, known as "Kölsch," has been served in Hellers Volksgarten since 1891. Back then, the outdoor tavern, located on a small lake in the middle of the park, was a favorite meeting place for Cologne residents. In 1837, Berlin opened its first beer garden in the Prater. The German capital gave the Bavarian tradition an urban flair, adding theater and vaudeville performances to the menu. Today, the Prater beer garden seats 600 guests in summer, offering them a cool oasis under tall chestnut trees in the middle of the bustling city. 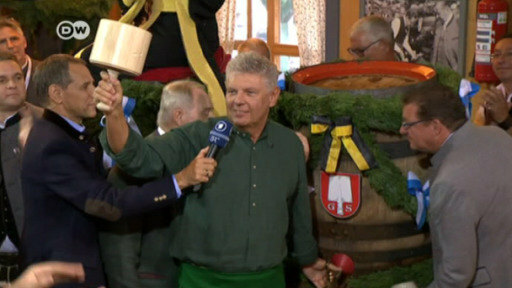 Munich's mayor, Dieter Reiter, has tapped the first keg of beer to open Germany's most famous festival. Six million visitors are expected over the next two weeks. Berlin is about as un-Bavarian as a German city can be, but that doesn't stop Oktoberfest from rolling into town every fall. Tamsin Walker went to find out if Berliners embrace the Munich tradition. The Oktoberfest is an export hit. In Leavenworth in the USA it is celebrated in a very authentic style, as the small town is a perfect replica of a Bavarian village. A cliché that attracts one million visitors a year.